The Missive Maven: I'm home! I'm back from vacation, refreshed and relaxed, and have finished reading a week's worth of mail. I wrote a bunch of postcards on our cabin porch when I had some down time, and this adorable baby red squirrel kept hopping around me as I did so. 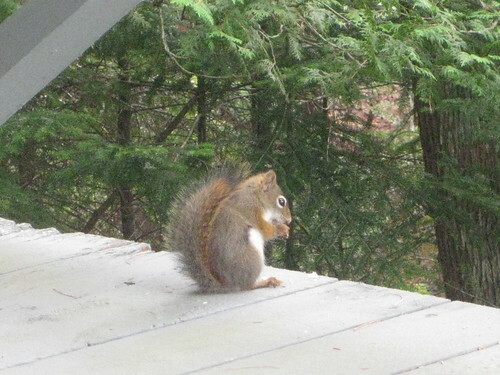 Those of you that receive a postcard that references the squirrel, now you can see the culprit. 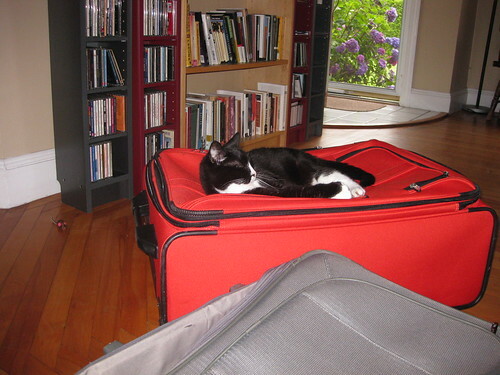 The cats were very happy to see us, and as usual, Soda claimed my suitcase as hers as soon as I walked in the door. (See the little brown mouse with pink ears on the floor to the left of the suitcase? That's hers, too.) Now I'm all unpacked, and I've finished the mountains of laundry, and my etsy shop is fully re-opened... but I've got house guests coming tomorrow, so diving into mail wholeheartedly will have to wait a little longer. Hope you had a good time! Just wanted to let you know I've changed my blog from allyouneedismail to ideacrafts.blogspot.com. Do you have a button so I can add you to my blog? Thanks, ideacrafts, I made the change in my blog list. I don't have a linked logo or button, but thanks for asking.